ESPN reporter Tom Rinaldi scored the highly coveted, first interview with Tiger Woods (post Elin busted his chiclets in with a nine-iron). After being stonewalled with a couple quick that's-a-private-matters and it's-all-in-the-police-reports, the soft spoken Rinaldi quickly switched topics to what America was really interested in, "his goals at Augusta." Rinaldi rarely challenged Woods ambiguous answers and never so much as asked about his link to performance enhancing drugs. 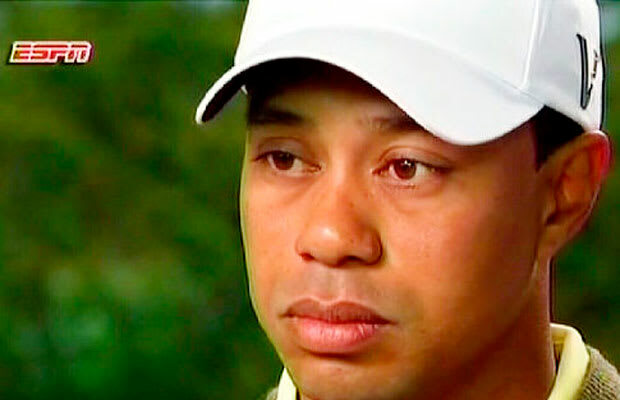 At the end of the five-minute interview, Woods looked almost sympathetic and Rinaldi looked like his starstruck fanboy which is, of course, exactly how the PGA Tour would have wanted it.